I had friends over to a neighborhood restaurant named Dalian yesterday because I got free vouchers for Gyoza (Japanese-style dumplings) at it. While in China, which is the land of its origin, boiled dumplings with thick skins are common, fried ones with thin and crispy skins are standard in Japan. 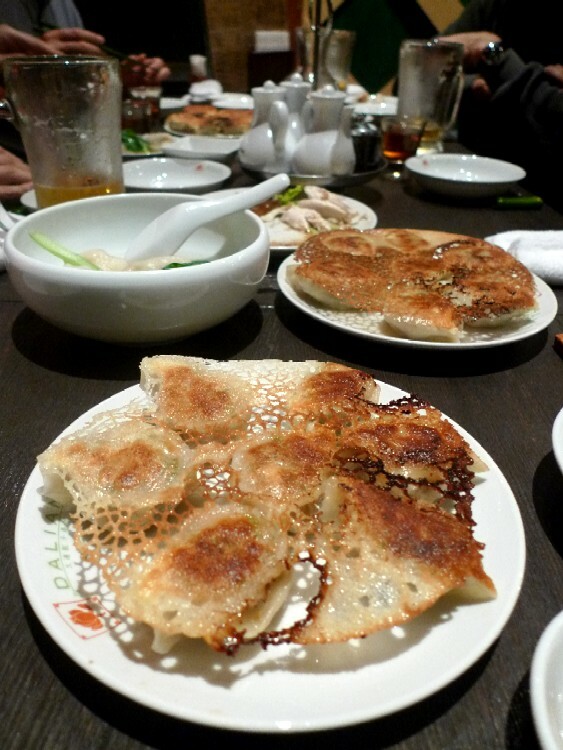 Recently, fried dumplings are called “Japanese style” in China. Other than dumplings, we ate and drunk as much as we wanted. Then, after the desserts, the all ladies and gentlemen who sat around the table swore to oneself to cut down on one's drinking and eating from the next day. I had seen seeing-eye dogs at events, but it was first time to see a guide dog at work. 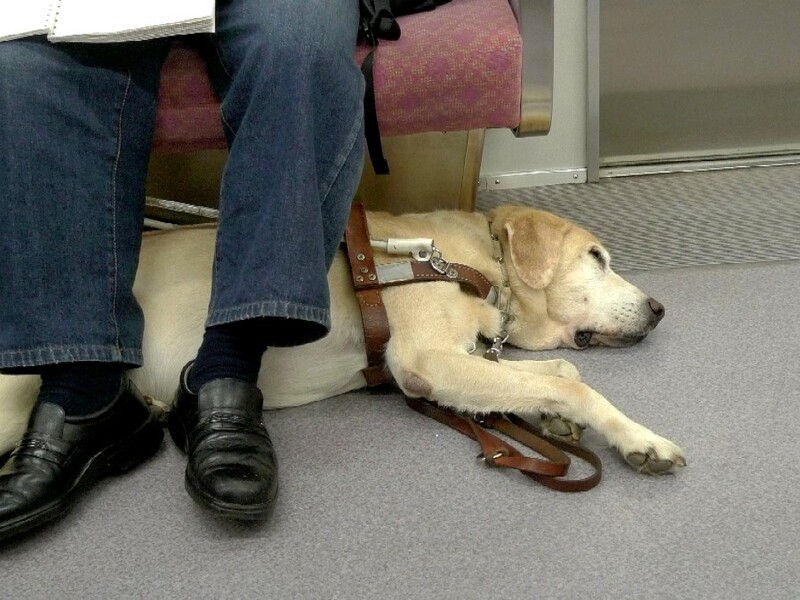 According to the Japan Guide Dog Association, as of 2009 there were 1,070 active dogs. There are as yet few dogs in Japan. 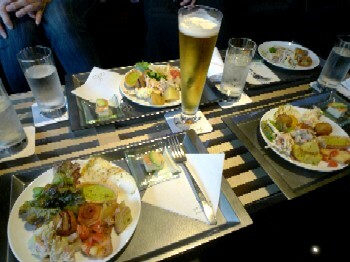 I had lunch with friends at a restaurant in Roppongi. Every summer, we enjoy a fireworks display together, but there wasn’t the opportunity this year because of the Great Tohoku Earthquake. Well, the disaster induced a mood of self-control among organizers of large-scale events, and many fireworks displays, including that one, were cancelled. Instead, we got together today. 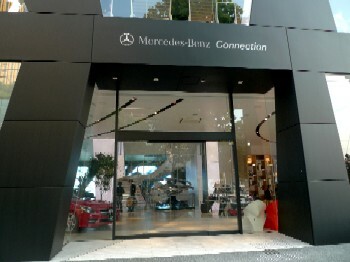 We chose the restaurant named “Upstairs” at Mercedes-Benz Connection, which is a facility for a limited time (only for 18 months) consisting of a showroom, a restaurant and a café. 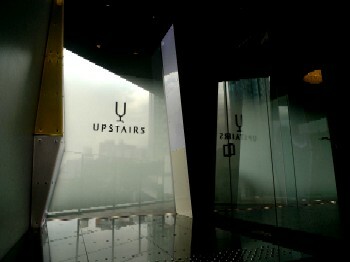 The restaurant is on the second floor as its name suggests. 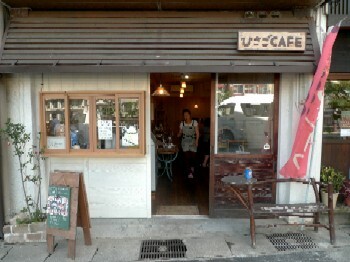 By comparison, the café named Downstairs is on the first floor. 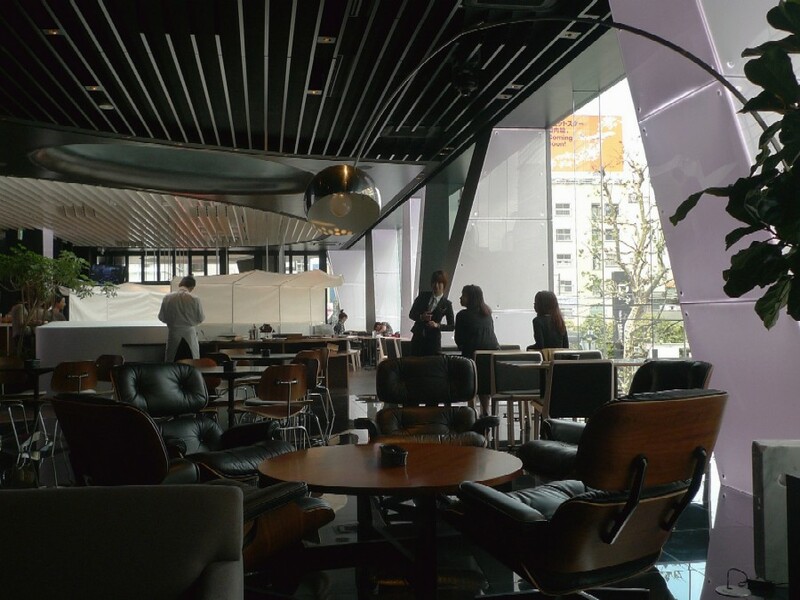 There are three lunch menus (including appetizer, salad and dessert buffet and after-supper coffee or tea): Soup Set (1,200yen), Pasta Set (1,600yen) and Main Set (1,800yen). 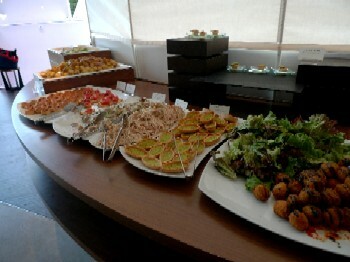 I think the lunch with the bountiful buffet was a good reasonably-priced meal. The facility that opened on July 16th will close and get knocked down at the begging of year after next. This is so wasteful. 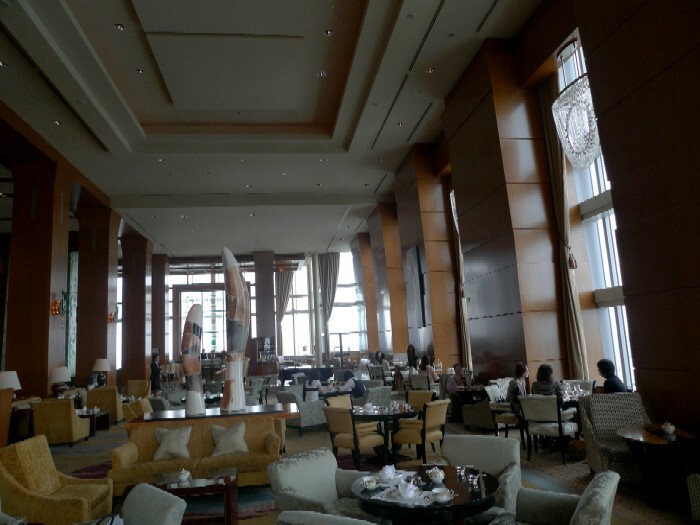 After the lunch, we went to see the Ritz-Carlton, Tokyo and got some tea at the lounge bar on 45th floor. 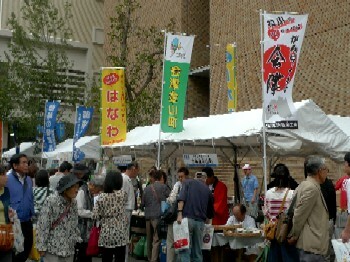 I unexpectedly encountered a festival by local governments throughout Japan this afternoon. Basically, a host of the festival was the NPO that encourages retired baby boomers to return their hometown, and there were consulting corners where you can get information about urban-to-rural migration. 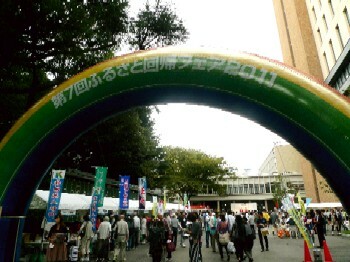 However, it seemed to be a product exhibition with farmers markets and food stalls, which featured the aid for the recovery of Tohoku district. I came flush on someone again at the festival. 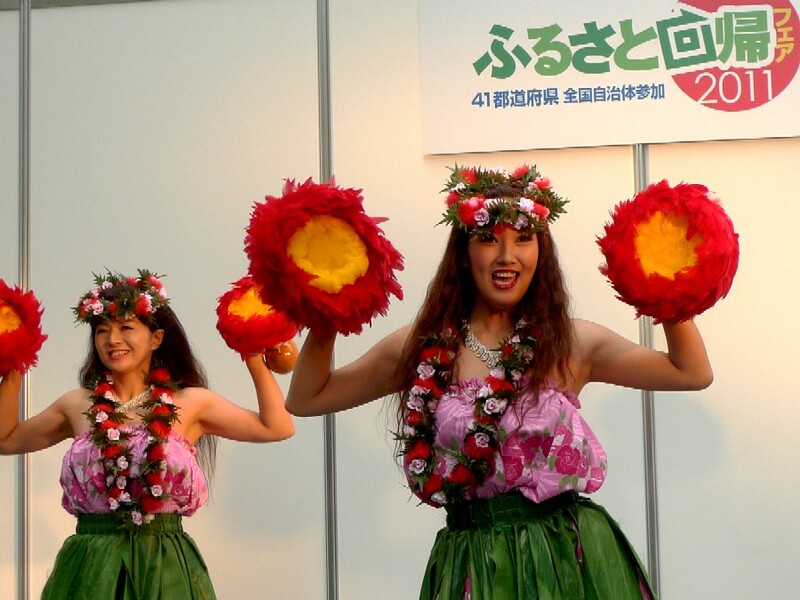 The hula dancing team, Halau Laulanani from Iwaki City, Fukushima Prefecture appeared on stage! 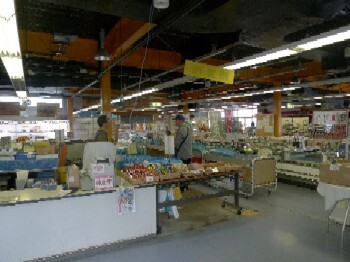 I saw their stage last April in Shinbashi when I visit the Iwaki farmer’s market (see the previous post). I can remember her clearly. This is her second time to come on to my blog. This time, I enjoyed the more powerful and glamorous　stage performance by many dancers. Members of the dancing team live in Iwaki City that suffers from the triple hardships, the earthquake, tsunami and nuclear accident. In April, the girls introduced theirselves in tears after the stage, but today, I saw their smiling faces from first to last. However, I wept again during their performance. 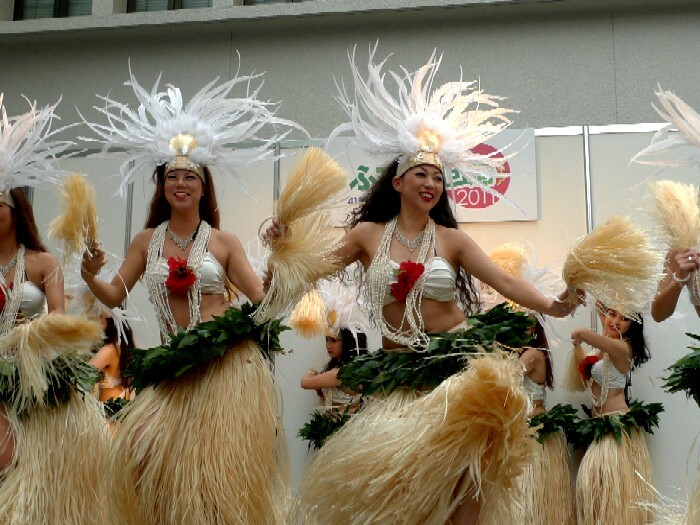 Apparently, for some reason, a formula “Iwaki + Hula = Eyewater” has been established in my heart. Due to a board in the picture below, I ended up talking with the police and doing research at the District Legal Affairs Bureau this morning. The building on the left is the neighbor’s house, and the one on the right is ours. Here are the facts. The board was a part of a fence that is set on the rooftop of the now-empty house. Last night, that thick and long object fell to the ground between that house and my house. During its fall, it hit and ripped a net window of a tenant living in the upstairs (we’re renting rooms on the upper floors). 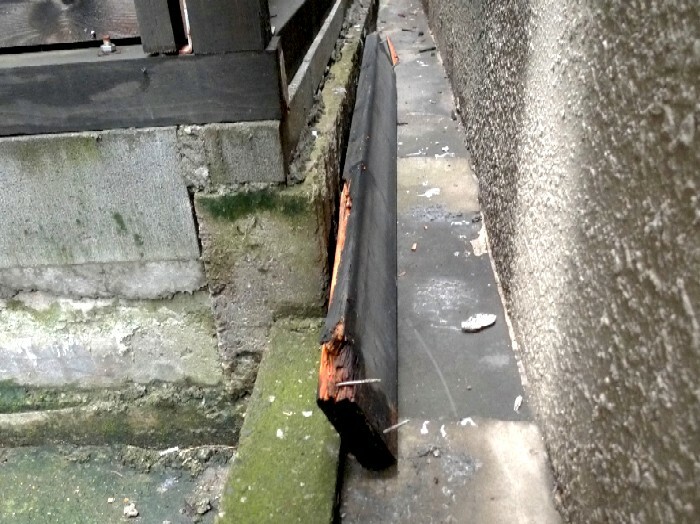 The tenant with poor recognitional capacity noticed the tear in the morning, jumped to conclusions that someone was trying to break in, and called the police. 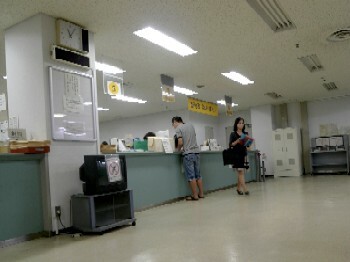 I attended the inspection first thing in the morning. While I was listening an appeal of the tenant who mistakenly defined that as an intruder, I thought back on the late-night noise and situation. My bedroom is behind the wall in the picture. Naturally, I did hear it, but I didn’t go to check what happened because I didn’t sense someone in the interspace of the houses and, anyway, it was too dark to see anything. I thought I would go look at that this morning. I excused oneself from the inspection, went to check the object, and came to the conclusions as explained earlier. Then, I showed the object, which was the same material as the fence, to a policeman and asked him to leave with courtesy. The problem was that neighbors including me didn’t know who owned that house and where he or she was. We had to ask the owner to reinforce the fence and avoid further fall, so I headed to the District Legal Affairs Bureau, found out that a company owned the house, and got in touch with the company. The bureau is very close to my house. I immediately received a phone call from a property company that is charged with the sale of the house. The caller, a person in charge, will handle the reinforcement work and replacement of the screen. The case is almost closed. In this case, I’m not sure if the owner avoided contacting neighbors. That house was build only years ago. The owner family came in and, shortly after, disappeared without making relations with neighbors. In Azabu, it’s not unusual that people get rich, buy a house, run out of money, and leave the house sooner than they expected. I’m not sure if it’s that case. I caught a Shinkansen bullet train, went back to Sendai and then, headed to Shiogama, a coast city sitting between Sendai and Matsushima Bay, on the evening of the day I visited Rikuzen-Takada. 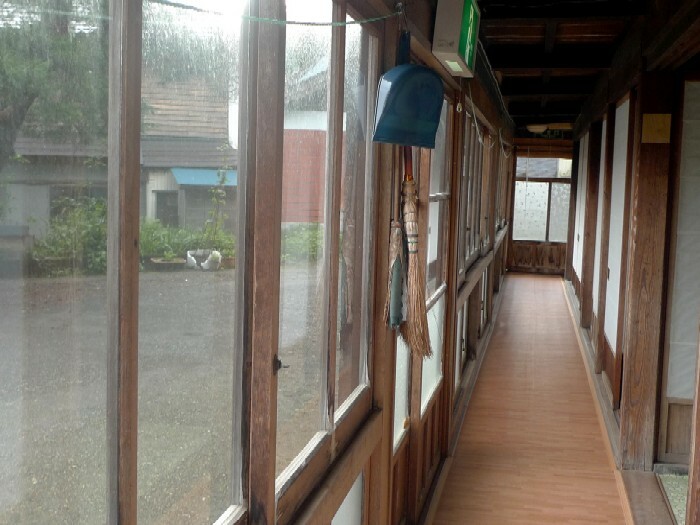 I met my friend living in Shiogama at the station and spent that night at her house. 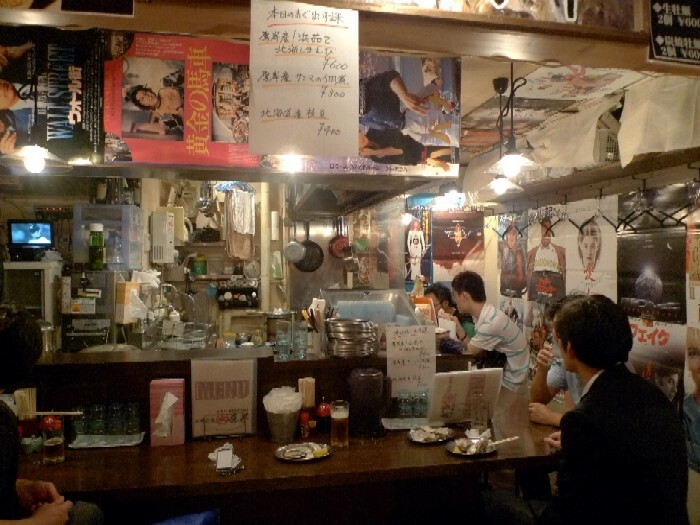 Before I set out on the journey, I thought I had to go back to Tokyo that night because I had something to do the next day. However, I reconsidered the schedule. Because “when you feel like meeting someone, just meet.” The Great Earthquake and Tsunami made me think that way more strongly than ever. 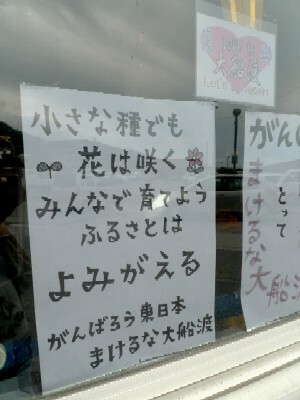 When the earthquake happened, she was at her house in a hilly area and her husband was in the mountain area of Matsushima. 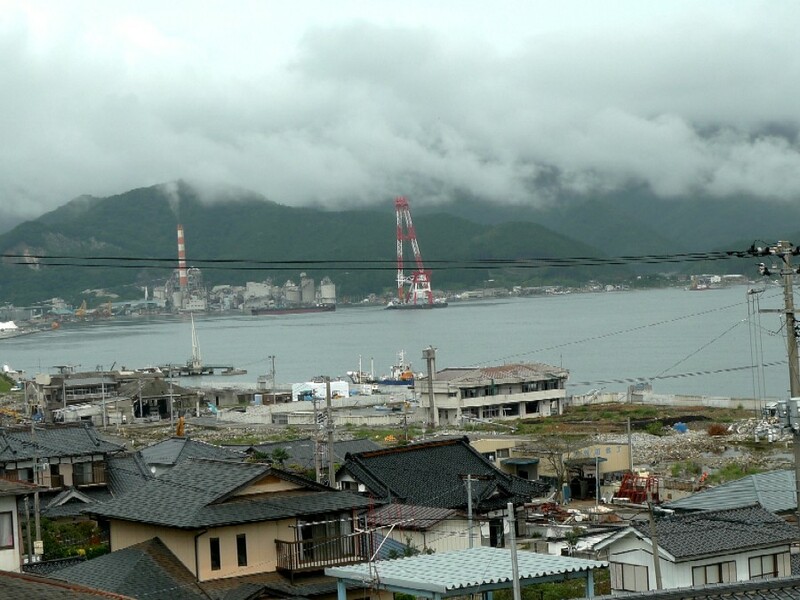 They were all right, but one of acquaintance living in the city became victim to the tsunami. 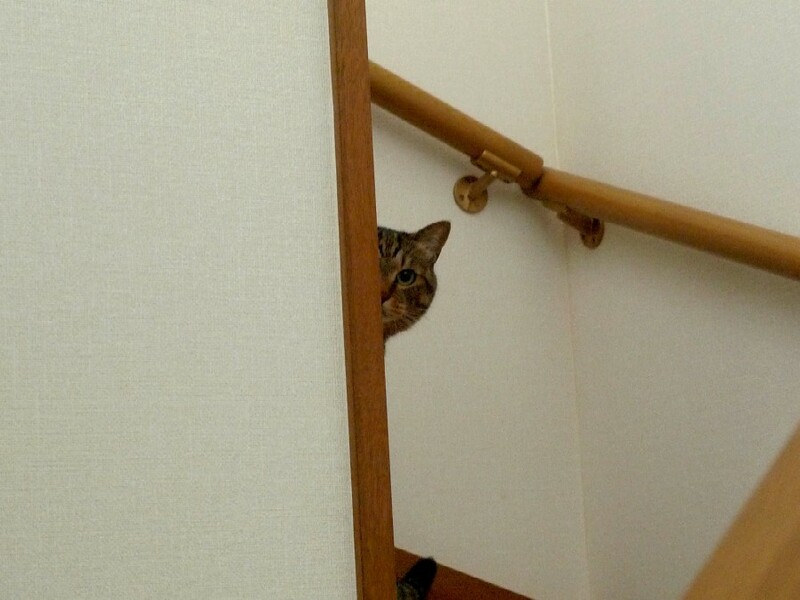 Being escorted to the door by her shy cat, I left her house early the next morning in accordance to her working hours. 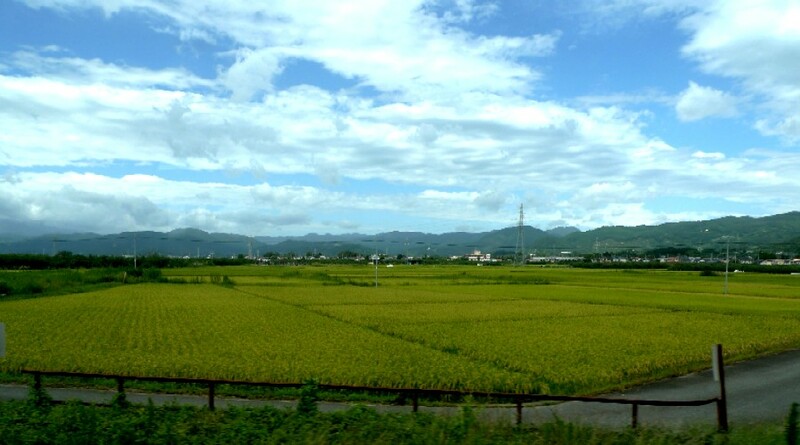 Then, I took a local train to Fukushima. I happened to be free that day, so I decided to stop for a moment in a hot spring resort near Fukushima Station. 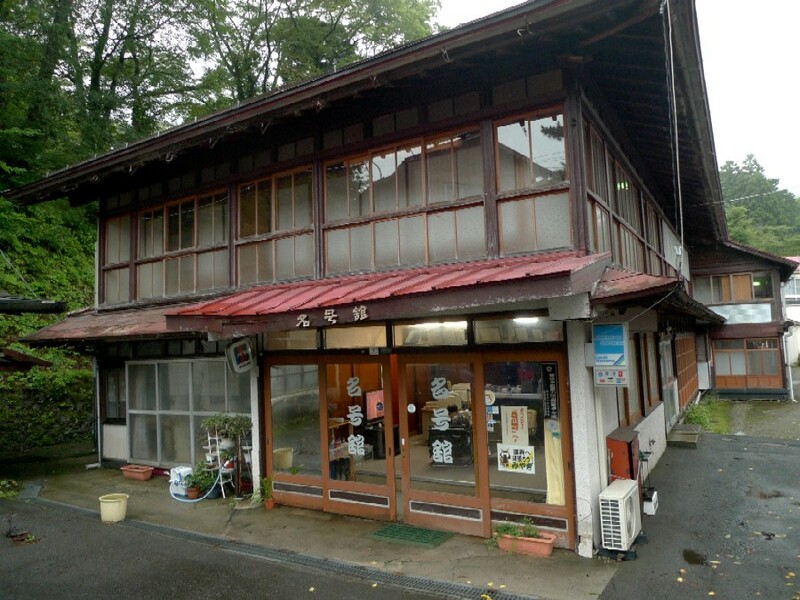 Because of good bus connections, I went to Tsuchiyu hot spring resort located in the western part of Fukushima City, about 16km from Fukushima Station. It took 40 mins. from the station to the resort by bus. 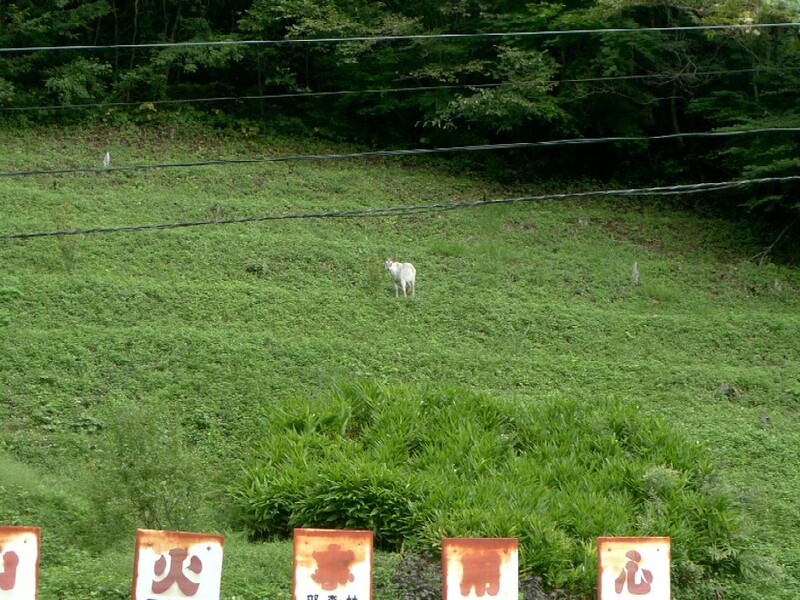 Indeed, wonderful places of nature are abundant in Fukushima. 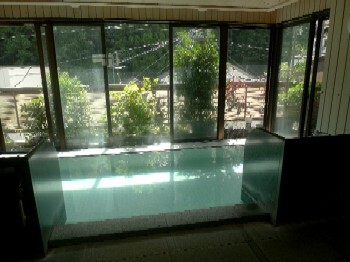 I took a dip in a hot spring at a hot spring in named Oogi-ya. 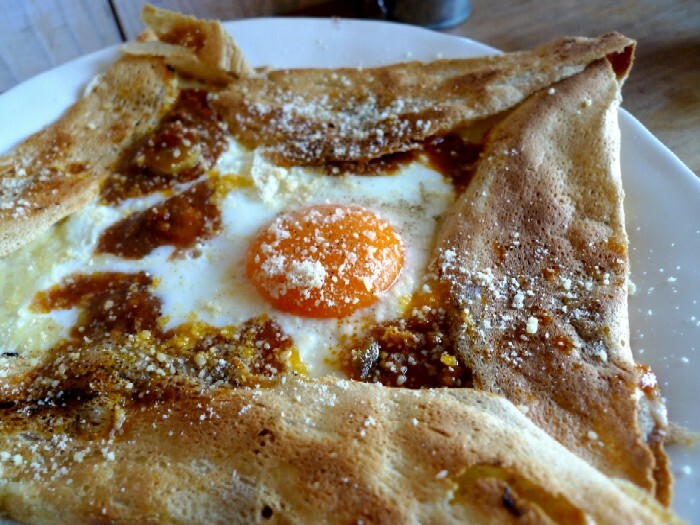 After the dip, I had buckwheat crepe Bolognese (a crepe and meat sauce) for lunch at Hisago café in the hot resort area. 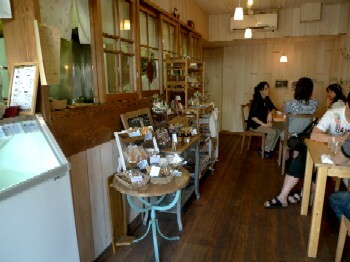 The only one café in the town attracted endless stream of visitors. 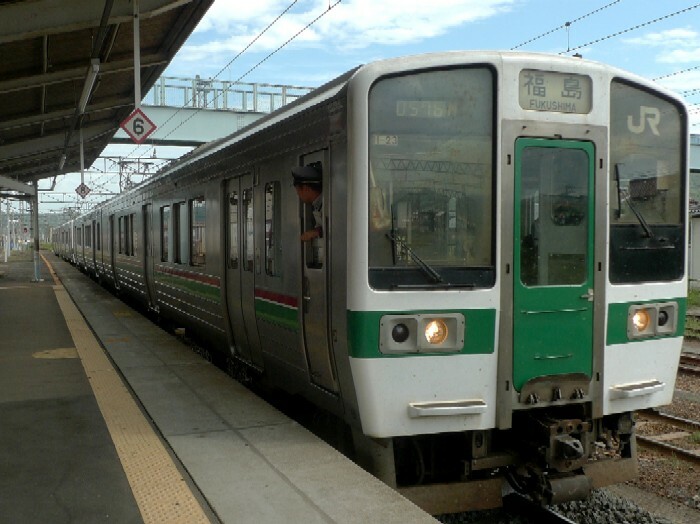 I slept well on a bus to Fukushima Station, and, at the station, I hurried along the platform and jumped on to a Shinkansen bullet train to Tokyo. This is the end of notes of the four-day three-night trip. 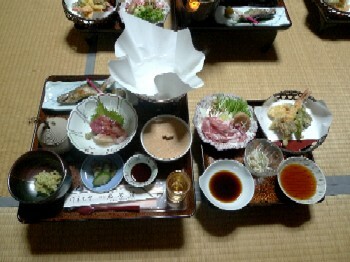 On the day my friend took me to Rikuzen-Takada, we had lunch at Osakana Center, d fish market and restaurants complex, in Oofunato, a next town to Rikuzen-Takada. 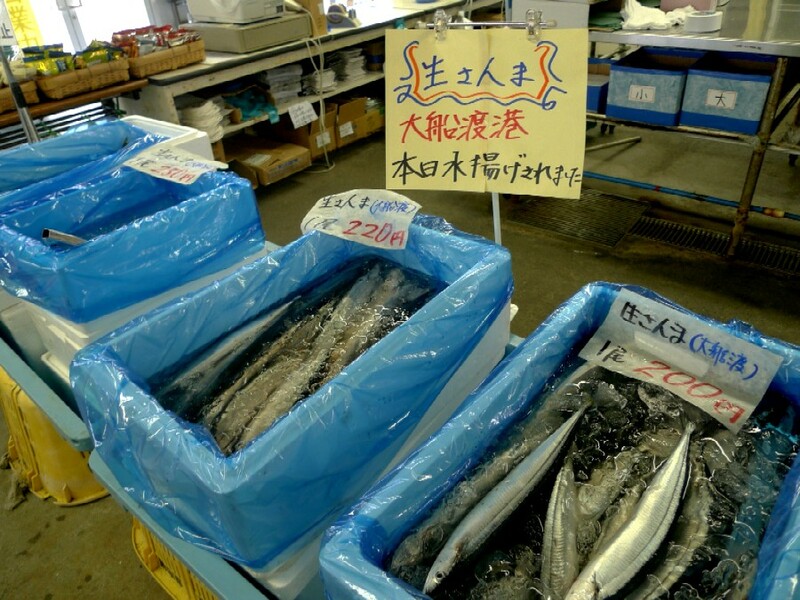 A fishing port in Oofunato is working! 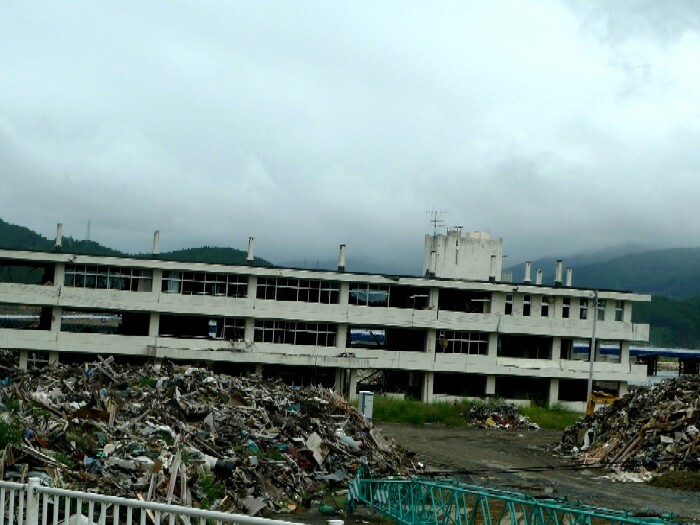 Oofunato City was also one of the tsunami-hit and heavily damaged regions, but the complex was spared the worst of the tunami (the building was damaged) because it’s located on a hill. 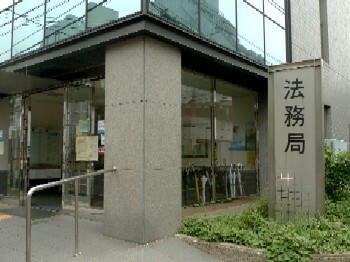 I heard that it reopened two days after the tunami for citizens. A seafood restaurant on the second floor where we had lunch reopened in mid-July. Everything was so normal at the restaurant that we couldn’t imagine the tragedy struck the city. 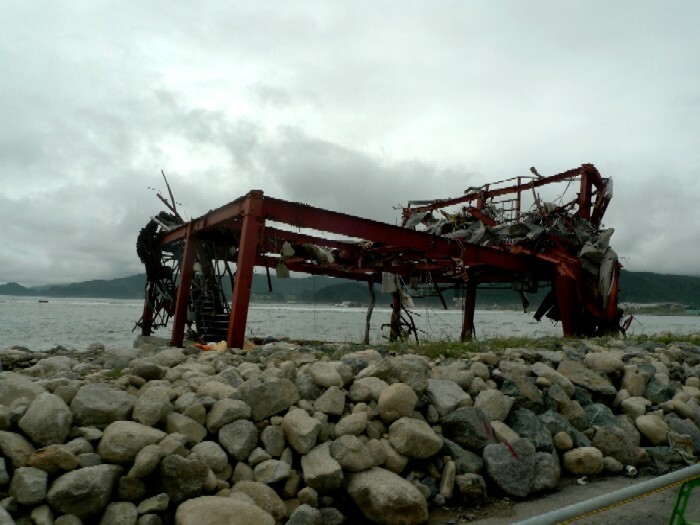 The condition of structural damage shows how the tsunami rushed. 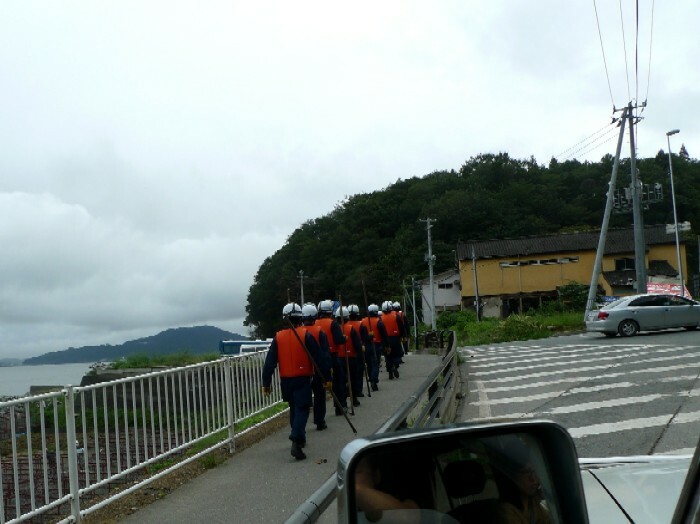 We had a pleasant happening on our way back to Esashi. At first I thought it was a goat, but it wasn’t. 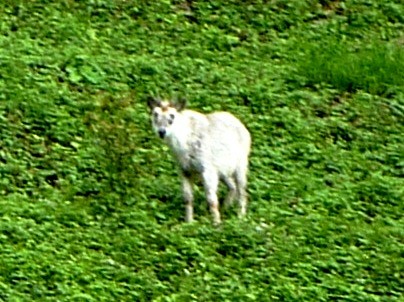 It was the Japanese serow (Capricornis crispus), a protected species! This was all I can do without a telephoto lens. After I split with my cousins at Sendai station next evening, I headed for Esashi located in an inland area of Iwate Prefecture where my friend lives. My friend and I worked for a same company when we were early 20’s. 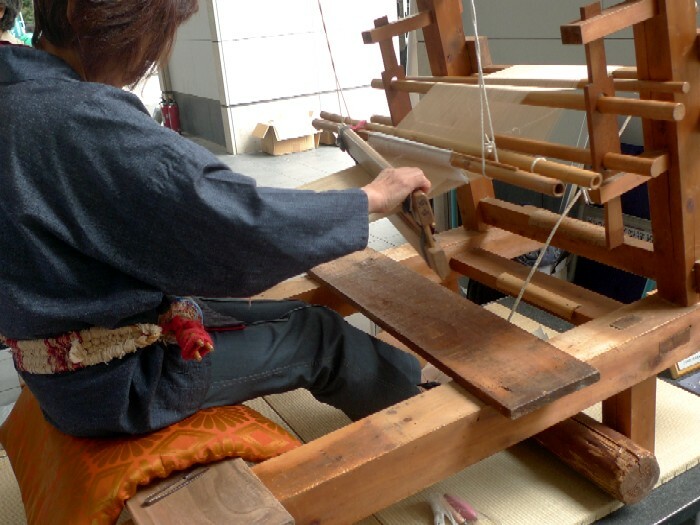 More than 10 years ago, she moved to Esashi that her husband transferred to. That was my first visit. Actually, last year, I planed to go there this spring. I thought if I traveled north with the "cherry blossom front", I would be able to enjoy the blossoms again in Iwate. 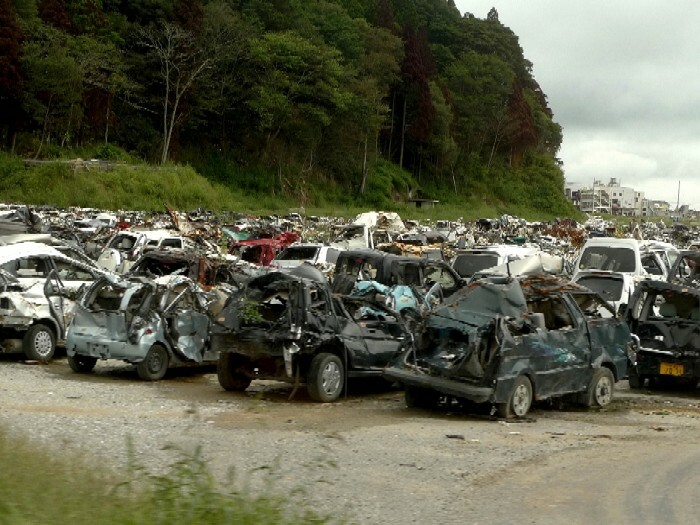 At that time, I couldn’t even imagine that the earthquake and tsunami on March 11 hit Tohoku. 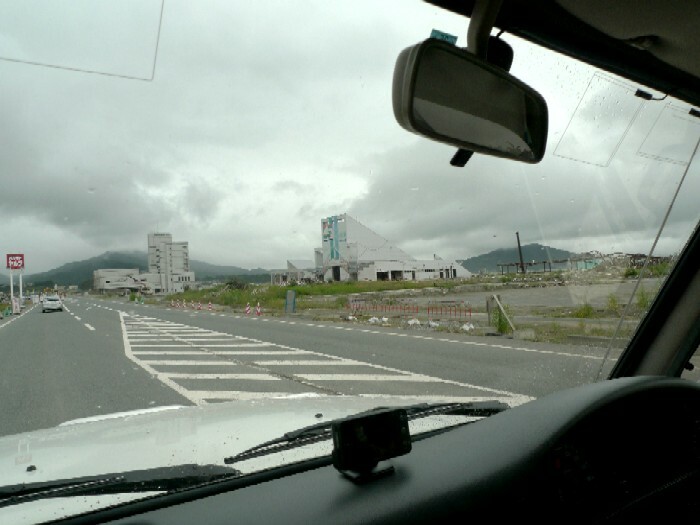 I stayed at her house that night, and the next day, she drove me to Rikuzen-Takada, one of tsunami-devastated areas in Iwate. 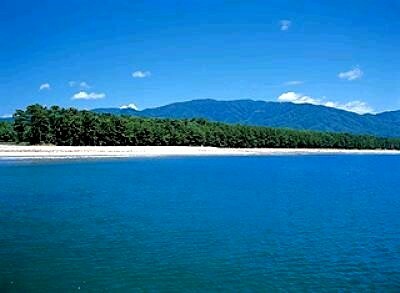 According to the tourism bureau of Iwate Prefecture, Rikuzen-Takada was introduced as “the southern gateway to Rikuchu-kaigan National Park, which has 2km of fine beach and pine groves.” For my friend, it was a favorite bathing beach. The beach and pine groves vanished away, and there is only one pine tree left. I took most of the photos from the car because we got out of the way of some people who were still clearing away the rubble. 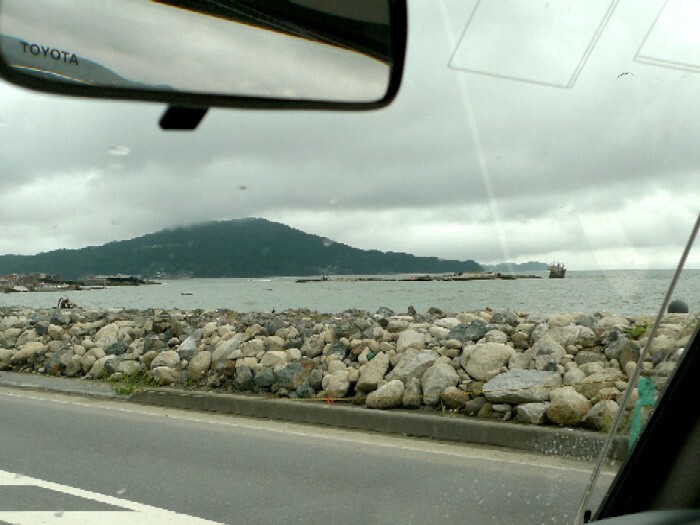 The ocean was about 600m away from the road. The search was still going on. They are riot policemen belong to our Tokyo Metropolitan Police Department. It’s more than 1 km from the ocean. 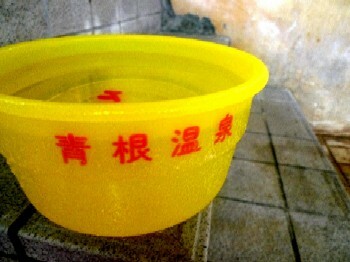 The seawater is never removed. I got out of the car, observed a silent prayer and stood in silence for a few minutes where I took the picture below. 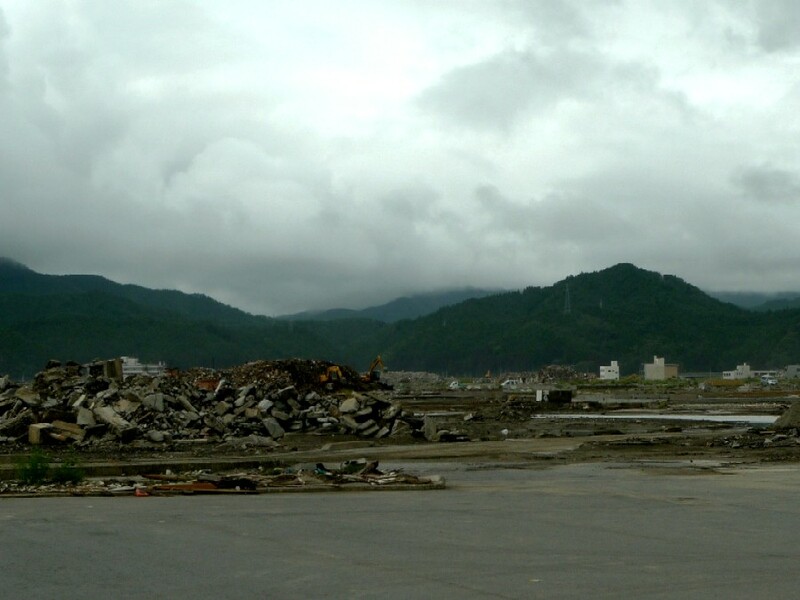 Though I watched videos and images of the tsunami, I realized what happened for the first time on the scene. 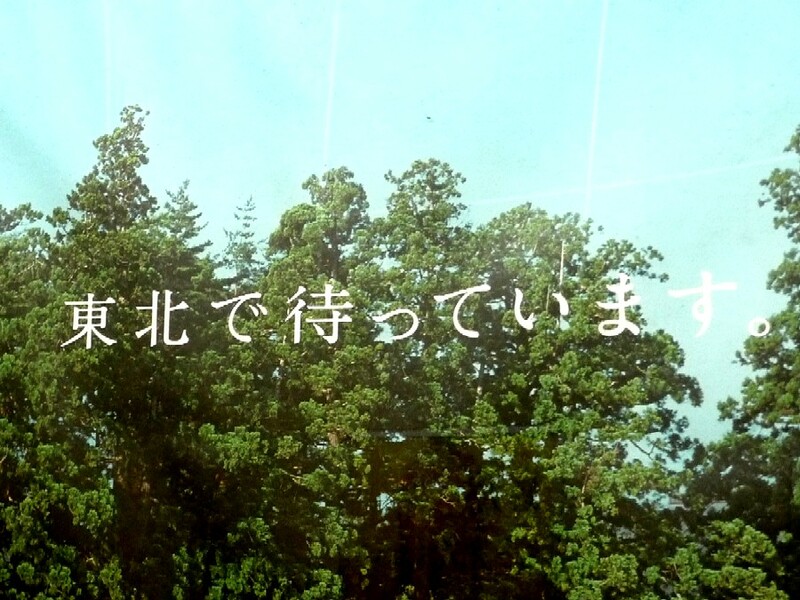 It's been six months since the Great Tohoku-Kanto Earthquake happened. How did you pass your days? 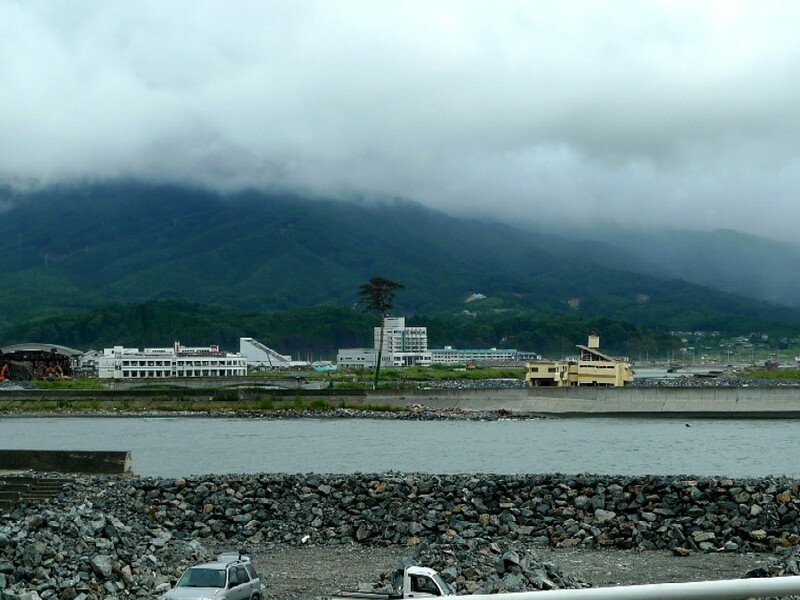 I traveled around Miyagi, Iwate and Fukushima from last Saturday to Tuesday. 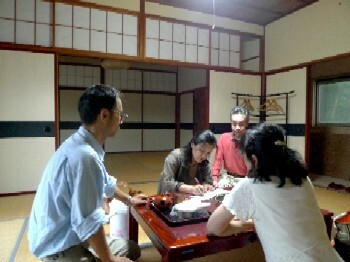 The purposes of the trip were (1) a reunion of cousins on my father's side, (2) renewing my friendships and (3) a pilgrimage to the areas hit by the tsunami. The trip began with the reunion. I have two cousins my age. One, who lives in Yokohama, is male, and the other, who lives in Natori, Miyagi Prefecture, is female. I meet them every now and then, but they saw each other just once before the trip. We were a party of four including the cousin’s wife. 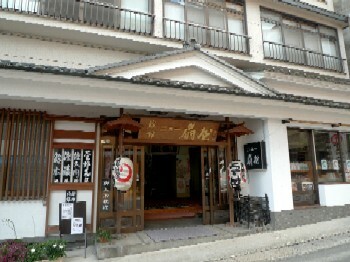 We chose Aone hot spring resort (Aone Onsen) as the venue. 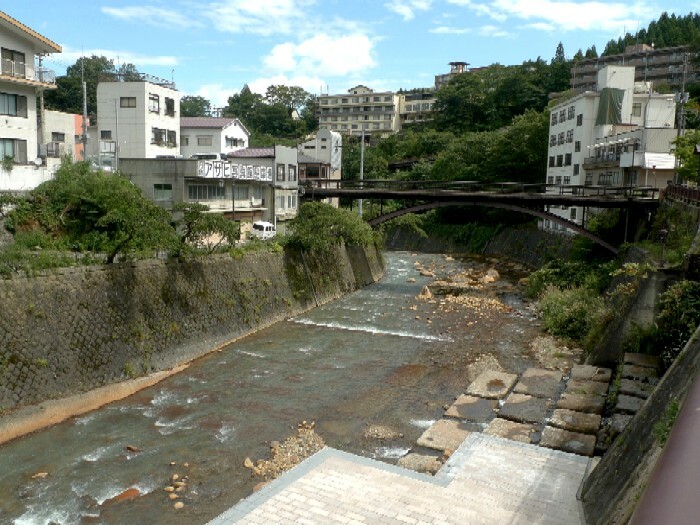 The small hot spring resort is in Kawasaki Town located in southwest of Sendai City. 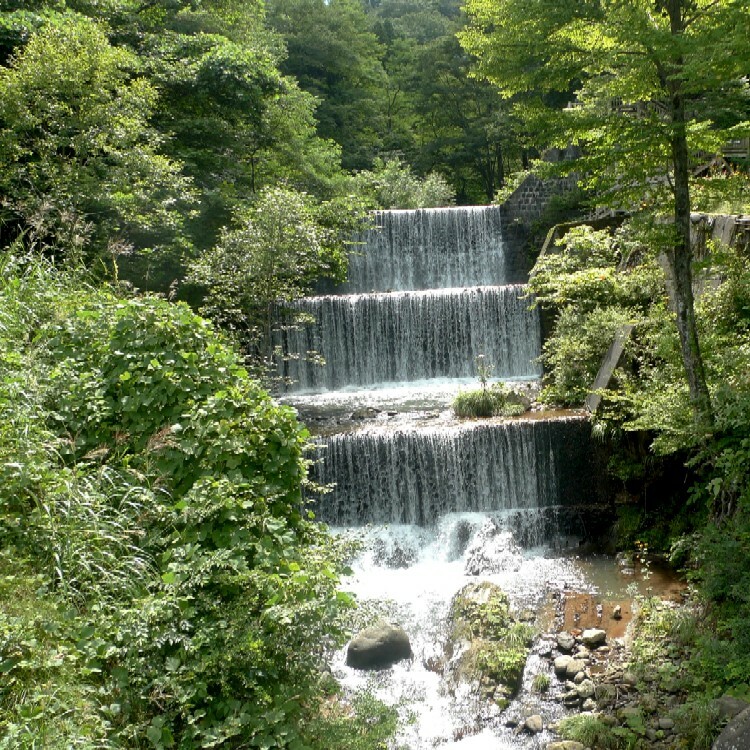 The hot spring, which was opened in 1528, is found halfway up one of the mountains of the Zao at 500 meters above sea. 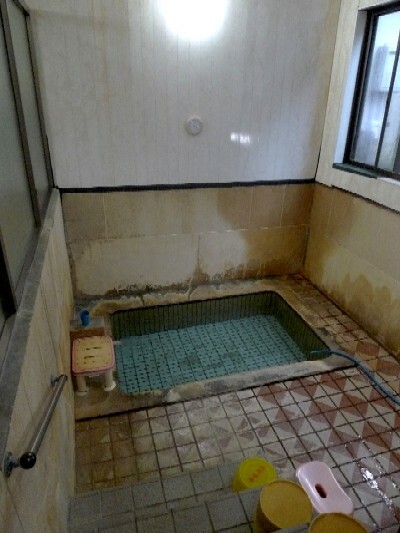 In the past, a bath specially made for the Sendai Date clan was in this area. 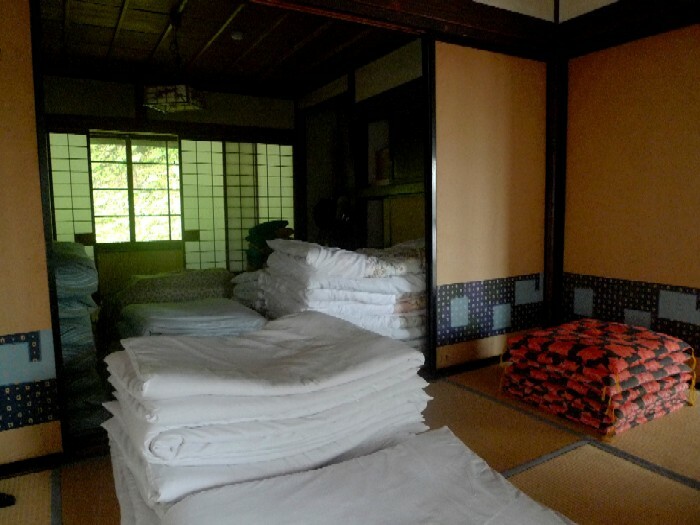 There are approximately 8 traditional Japanese-style inns. 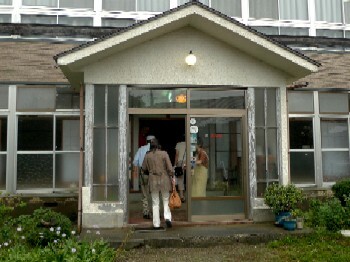 We stayed at the rural hot spring inn named Myougou-kan that was first brought into being well over a hundred years ago. This is the main (decrepit) building. Actually, we stayed at the relatively new annex. We made free use of the two rooms. The water was mild and fragrant. The bathroom was old but clean. That day, there was no guest except us, so I walked around the inn and took pictures. 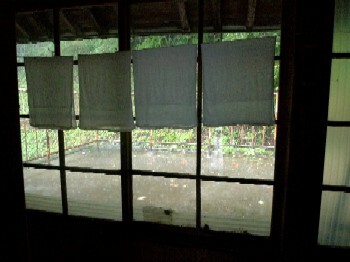 Every thing of the inn had a Showa look. I mean I felt like going back 30 or 40 years. 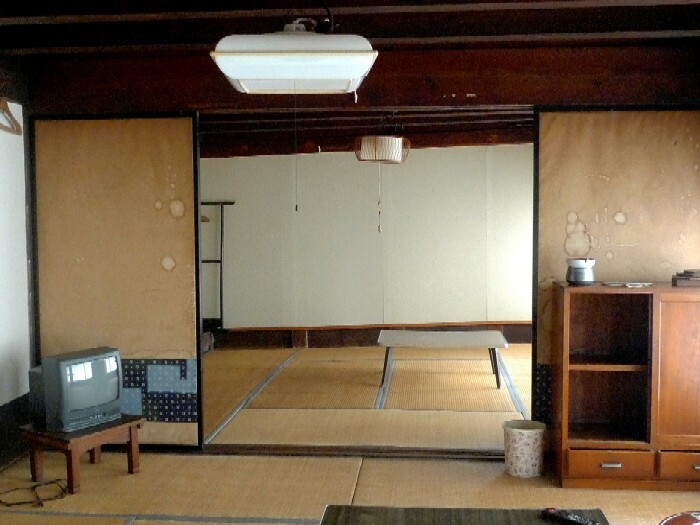 Myougo-kan accepts toji staying (self-catering staying). Toji means "hot springs recuperation" in Japanese. 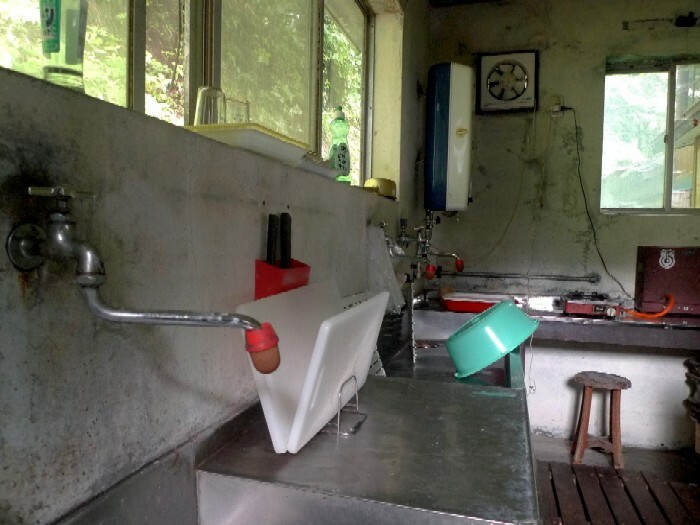 Even now, some people spend a long period of time cooking for oneself in a hot spring resort for toji. Do you think the room isn't quite level? Yes, it’s inclined. 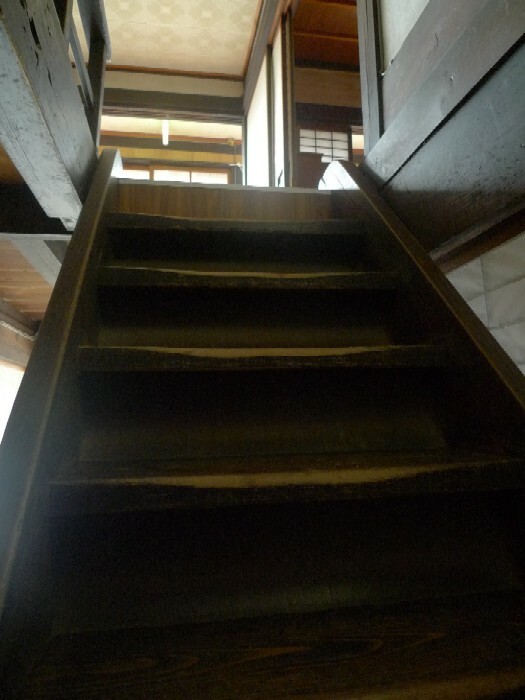 The footworn stairs shows a history of the inn. My cousin living Natori was at work when the earthquake was happened. 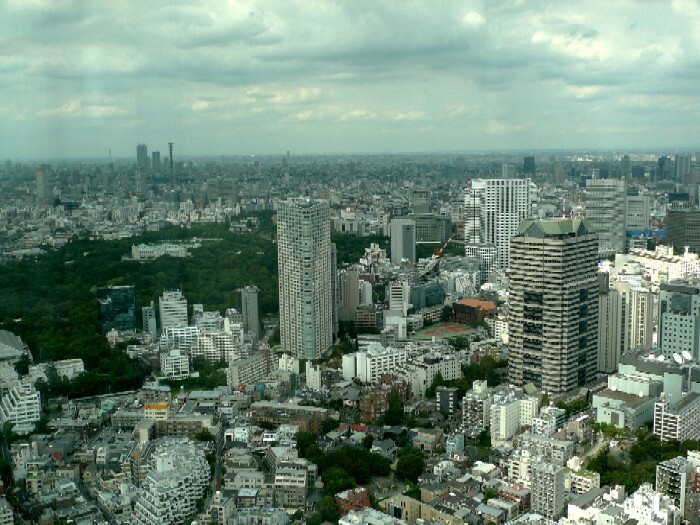 (Her office is in the mountainside of Sendai City, and her house is in the mountainside of Natori City.) 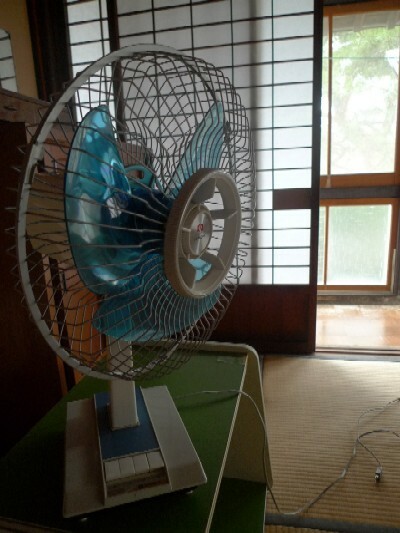 She and her house were safe, but many her acquaintances suffered damage from the Tsunami. Oysters made in Akkeshi are one of my favorites. Akkeshi is a town located in the southeastern part of Hokkaido and famous for its oyster fishery. I had oysters form Akkeshi in Sapporo the other day at a restaurant named Dai-Akkeshi where we can have seafood direct from the town. The restaurant is too casual, but I think it’s nice to stop at it for a moment and toss few oysters into one's mouth. 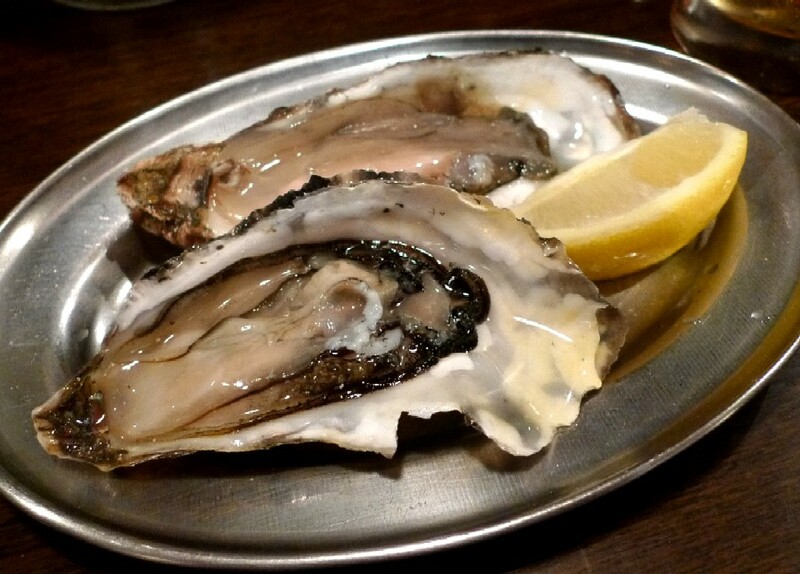 In Akkeshi, the sea temperature is relatively low all year-round, so we can enjoy the low oyster whenever you want. 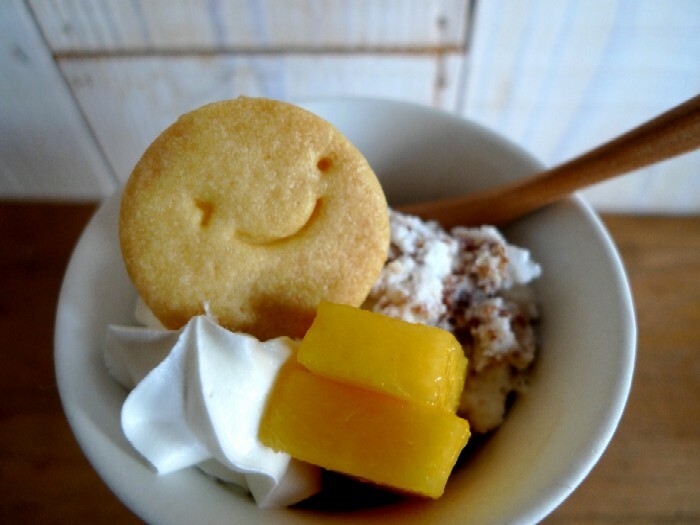 However, it was still too early for the season, and they were thin and had a harsh taste. I have to wait until the sea temperature drops. I get depressed thinking about oysters this year. 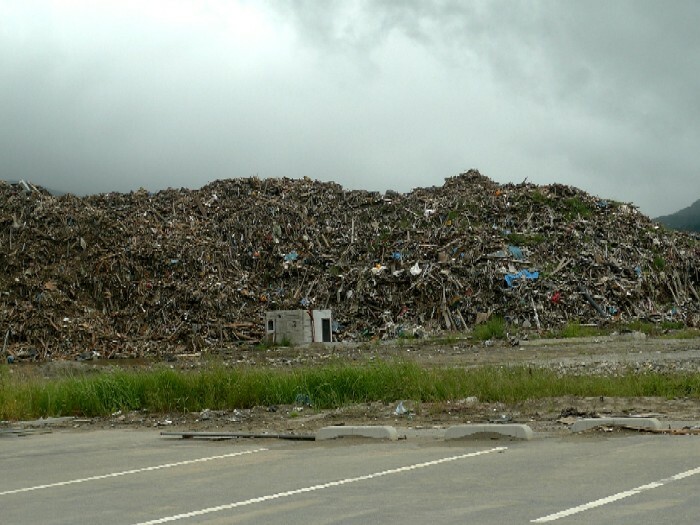 The Sanriku coast of the Tohoku region that should not be forgotten in talking about Japanese oysters was badly affected by the Great East Japan Earthquake. 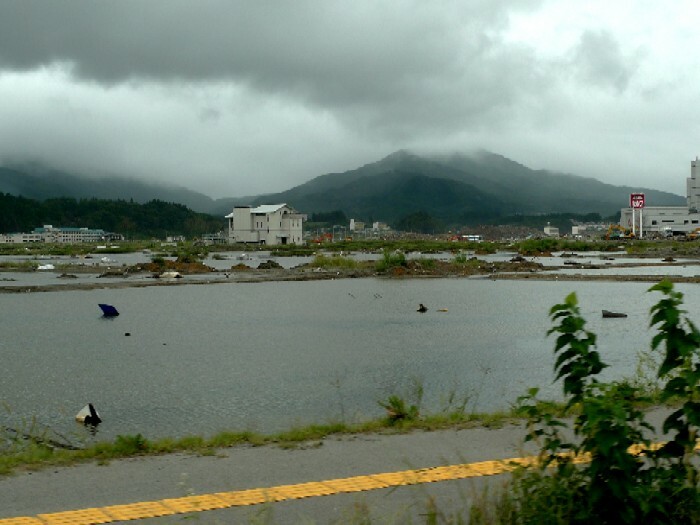 Of course, oyster farms in Sanriku suffered catastrophic damage, so it’s hard to eat ones from there for years. The most saddening thing is that I have no idea when I can have Hamaichi- Creamy Pearl Oyster. Hamaichi is a town in Higashi Matsushima City near Sendai. I had the oysters form the town at oyster bar, “Season”, in Roppongi last year for the first time, and really loved them. So, I conducted a Web search on the oyster and found Mr. Yoshima Kano was the leader of processors in Hamaich. After the Earthquake, I was concerned about him and checked in lists of refugees. I found his name on one of list. He was OK. I do hope Mr. Kano and his company will re-establish the oyster farming.